My Baggage provides a quick, cheap and stress-free student removals service, to help you transport your luggage safely within the UK, to Europe or overseas. No matter what stage of studying you're at, My Baggage can help make the load a little lighter. Whether you're moving into student halls, going back home at the end of the year, taking a year abroad or moving into a new student flat, we can move all your belongings to where they need to go. You can get a quick quote from us any time. We offer student removals in over 200 countries around the world. Quick and easy online booking 24/7. Door to door luggage collection and delivery. Same day collection and next day delivery on many routes. Full online tracking, as well as text and email notifications. Dedicated customer support via phone, email and live chat. Find out how to contact us. Packing your bags and suitcases to go to university, or come home at the end of term, can be quite a hectic exercise, so make sure that you have everything. A great way to ensure that you have all the vital items is to jot down a list of stuff that you definitely need. Our handy student packing checklist is a great place to start. Before sending your bags and suitcases off with a student removals service, just tick what's there and then rush around and find what is missing! When booking removals with My Baggage, all your belongings will need to be packaged securely when our removals drivers arrive to collect the items. We recommend using either suitcases or strong cardboard boxes to keep your items as safe as possible. Find out more about packaging here. Once you've booked, we give you the labels - all that you have to do is put them on the bags, suitcases or boxes and you're away. After that, we’ll collect your luggage and deliver it to where it needs to go. Sounds simple and it is. 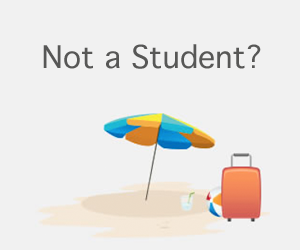 You can book your student removals with My Baggage online, any time. If you’re the kind of person who leaves things to the last minute, don’t stress, you can book right up until 10pm the night before your collection. Or, if you’re super organised, you can book your removals as far in advance as you like. With My Baggage, you can even forward your belongings so they’re ready and waiting for you when you arrive at your student digs, or back home again at the end of term. We offer super fast delivery within the UK and worldwide. Get a quote from us, to view your expected delivery date. No matter what you need to send, My Baggage can help. We offer student removals for items from 1kg up to 30kg and you can book as many items as you like with us. This will make life easier for you and will give you that extra peace of mind when you’re handing over your treasured belongings to the removals drivers. We can also send you alerts via email and sms when your items are collected, out for delivery and many more events. My Baggage is the No.1 Student Shipping Company. We send luggage for more than 30,000 students, so you can trust us with your luggage. And if you have any questions, you can always contact our team via phone, email or live chat - we’re always happy to help. We have got you covered so you don't need any last minute panics about the safety of your belongings. For every item that you book with our student removals service you will get £100 free compensation cover, which should take a load off your mind. If you wish to add extra compensation cover, you can do so when booking. You can add up to £1,000 worth of compensation cover if you wish. Before booking, we recommend taking a look at our list of prohibited and non-compensation items. How Much Do Student Removals Cost? My Baggage offers a low cost student removals service. As all of the My Baggage team are former students, we understand the need for a budget service that doesn’t break the bank. Get a quick quote below to see how much it will cost. And, if you do happen to find a cheaper price elsewhere, we’ll try our best to beat it using our handy ‘Price Match’ tool.